Puerto Bolivar on Juy 2017. Source: Carlos Barros. Following our recent publication on the troubles that the Turkish port operator Yilport Holding has lately encountered with its project in Ecuador while developing the terminal at Puerto Bolivar, we have received an official statement on the dispute, which was issued by Robert Yuksel YILDIRIM, the Chairman of YILPORT Holding and President & CEO of YILDIRIM Group of Companies. We appreciate the wide interest our article has caused among the industry professionals and the keen attention on the part of Yildirim and would like to provide the opportunity for the Group to explain their view on the situation. Yilport commits to invest USD 750 mln in the expansion and modernization of the port in 5 phases. Phase 1 will take 3 years and will bring the investment of USD 230 mln. The company aims at creating a container terminal as well as keeping the existing bulk banana services. 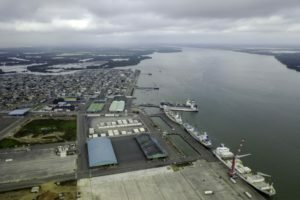 However, the new container terminal will be designed to provide more options to shippers and banana exporters and create an advantage for shipments from Southern Ecuador. But Yilport informs that the project has not been started yet. Its launch has been delayed due to a number of problems. First and foremost is the expropriation of the land, which the Ecuadorian government should complete before the construction can start, according to the PPP agreement. The second issue is obtaining the required licenses. “As of December 2017, all of the permits to develop the container terminal have not yet been collected,” says the company’s statement. It does not mention which licenses are still pending but highlights the company’s commitment to “fulfil all the license obligations by global high standards such as the environmental impact assessment (EIA) taking into account the extra conditions stated in the concession”. Yilport has obviously been working on resolving this issue recently, as according to the local media, an agreement between Yilport and CORPODET EP, a public company from the El Oro province, to do the dredging was signed in early December. The start of the 9-months project, although still being subject to Yilport’s obtaining some permissions, is planned for February 2018. The works will be financed by the provincial government. Port.Today will continue monitoring the situation and will keep our readers well informed of the developments.